OOOH! Look :) I'm so lucky!! I took a 2 second break from writing, and looked at the treasury count. It was at 222 and one was expired! YAY!!! All mine!! 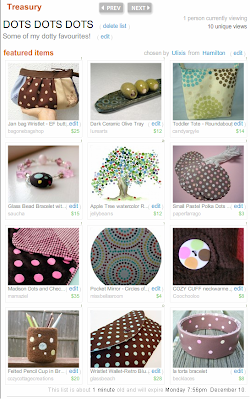 Check it out ~ a selection of DOTS DOTS DOTS! congrats! I really like that top left handbag, but i see it's not in the treasury anymore...sold?